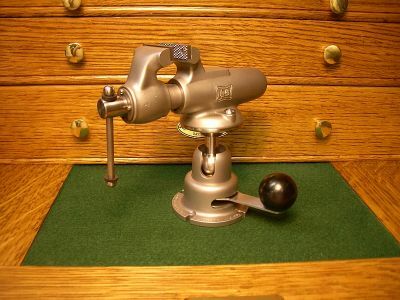 One day working in the shop, not long after completing the 3d CAD models and drawings for the Morrison & Marvin “Model Builders Vise” I received a package in the mail. It appeared to be just a typical package but when I opened it I realized my life was going complicated for a while. Inside were several beautifully made wax patterns of complex, unusual shapes. There were some hand sketches included but they did not help much. The sketches had dimensions larger than the patterns? Closer inspection revealed the logo of Morrison & Marvin on two of the patterns, so at least I knew where they came from. I studied the lines and numbers and realized I must have the full size dimensions and this was a quarter scale model. Then knowing Morrison & Marvin castings are often combined to save foundry costs and provide a chucking lug I realized I was looking at a one quarter size Kurt Style Mill Vise. The number cast in the bottom "D-15" must indicate the size was 1.5", quarter size of a 6"
I called my friend Roland Morrison of Morrison & Marvin Engine Works and he told me I already had the plans sitting on my mill. He did send me some SurfCAM files that Marvin Hedberg had used to cut the molds. Unfortunately Marvin uses a older version of SurfCAM that is not compatible with the newer solid modeling programs. 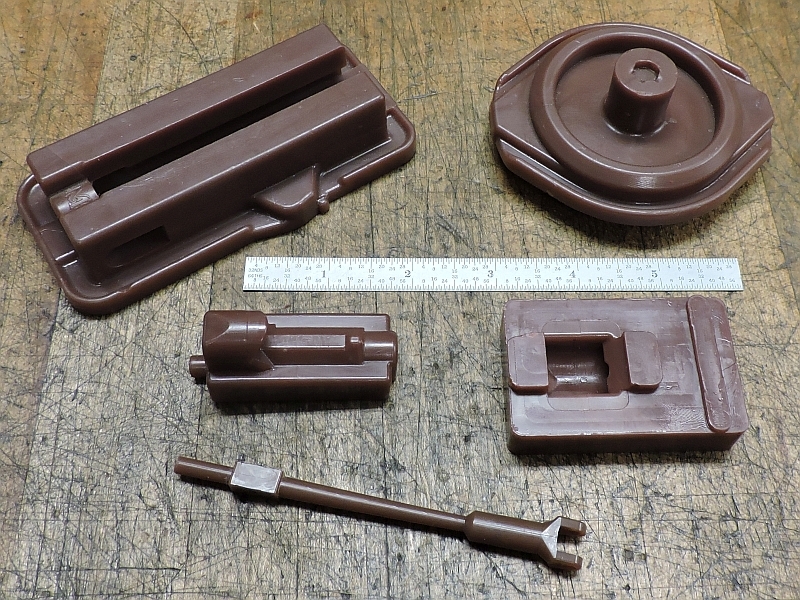 Now the project was not only to machine the castings when they arrived but make working drawings so all the parts would fit. To do this, 3d CAD models of all the vise parts needed to be created and assembled. The castings from the foundry were going to be out a few weeks, so I had some time to get going on some 3d models. 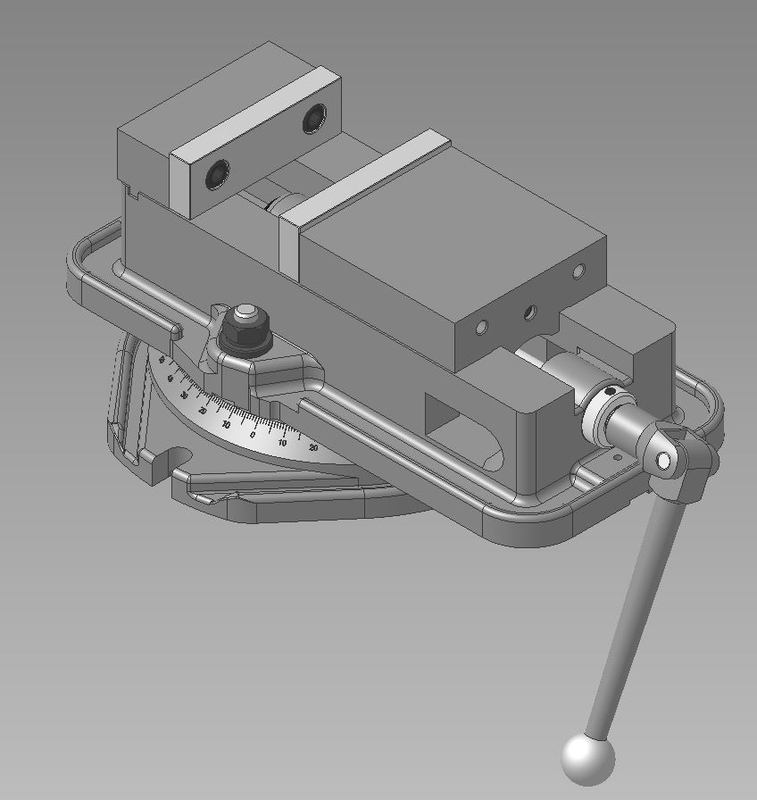 Using the wax patterns, Roland’s sketches, and measuring a full size D-6 vise all the parts were modeled and assembled in Alibre. The wax patterns were the most useful in the modeling process because they were an actual representation of the castings. I needed to determine how much material would need to be removed from the machined surfaces to maintain proper alignment of the screw, nut and jaws. Marvin had left plenty of material for machining, just a matter how much of it to remove. Here is a screen shot of the 3d model. If you are interested in seeing the Model Builders Vise drawings they can be downloaded for free here. And if you are curious to have a look at the current state of the Mill Vise drawings they are located here. Roland may chime in here with some interesting information about some guy named Muggli. Dave, I was on the website yesterday wondering when the castings would be available. This will be a fun build to watch and I can hardly wait until I can get a set of castings. I’m pretty sure Roland will know the status of the castings; I do know that the foundries that do investment castings tend to have long lead times. 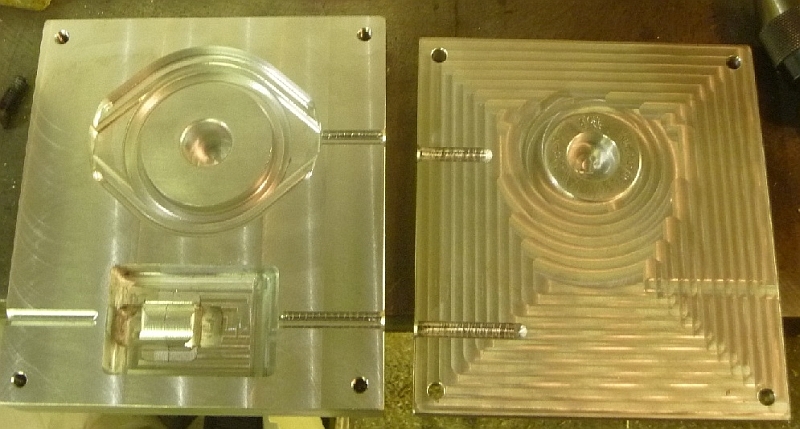 I thought that it would be fun to include a couple pictures of the beautiful molds that Marvin machined. This is the mold for the body and the nut; notice the sliding core that makes the cavity where the nut runs. There are also two more removable pieces that form the openings on the sides of the vise body. It is hard to see but there is also a removable piece for the nut because there is an undercut on the casting that would prevent the wax form being removed from the mold, not to mention nearly impossible to machine. This is the mold for the base and jaw set. The jaw mold also has an insert for the same reason described above. Marvin is an absolute master at this type of work. That is some beautiful mold work Dave. Thanks for showing it. It should have been easy but of course it wasn't. It is my experience that most of my projects take twice as long as expected and cost four times more. This one was different. It took four times longer and cost eight times more. 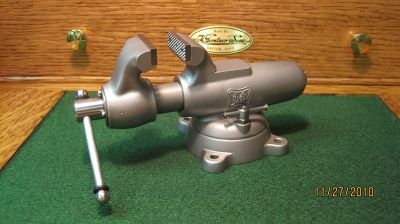 Compared to the ModelBuilder Vise the MillVise should have been simple. 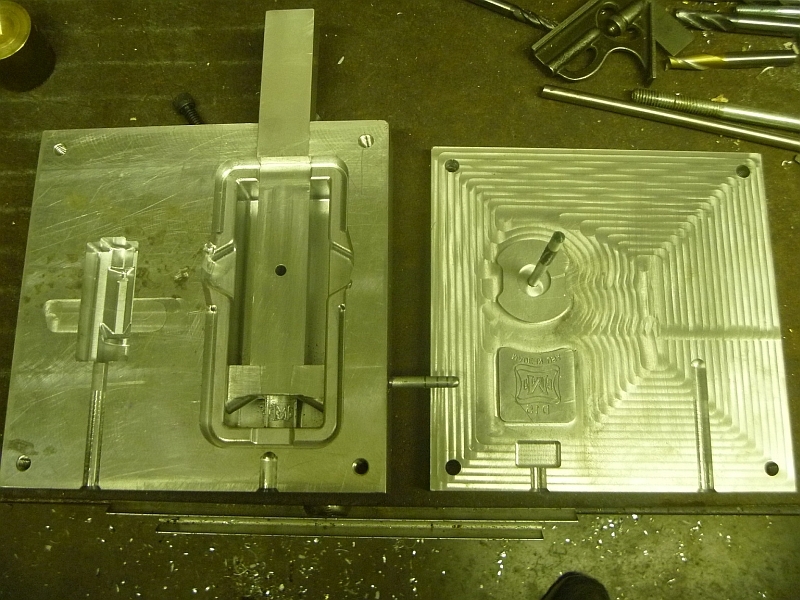 No compound curves and difficult holding problems, all straight lines both for molds and machining. How could it be difficult? Disassembly of the genuine Kurt D6 sitting on my mill showed no hint of difficulty. The half ball which is the heart of the design, could be made on the end of a piece of O1, parted off and hardened. The left hand screw could be single pointed and the nut could be tapped by a common left hand tap. No difficult acme threads in this one. What could possibly go wrong? I asked around and soon had a 5" and a 6" Muggli which are very similar to a modern Kurt. 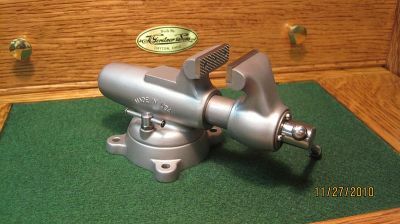 Kurt had purchased the patent about 1977, simplified the castings a little and made it a machine shop staple. Bill, Chris, & Roland, thanks for stopping by. Roland thanks for the information on Mr. Muggli; I think Kurt would like us all to believe they invented the angle lock vise. Chris I’m not sure about the availability of completed vises, my guess is no but you would have to check with M&M. I can tell you that it is a fun project and a great kit that comes with not only the castings but all the hardware and materials. I built mine almost eight years ago, I did a build thread on the other site but I don’t think I ever did one here on MEM. I could if there is interest? Here are a couple pictures of my Model Builders Vise. I would love to see the build thread! Do you think it is do-able on a small (Sherline) lathe/mill? Or does it involve turning larger diameter parts? That's beautiful Dave. How much use does it see? Hey Chris, It's not very big I don't see any reason why it couldn't be built on Sherline tools. The Sherline lathe will swing the movable jaw over the bed but not the cross slide. This piece needs to be turned and bored. I will try to get a build thread put together in the near future. Thanks Bill, It doesn't see much use because I don't want to bang it up. But with the 41xx steel castings, bronze nut and Acme screw it is very capable of being put to work. Great - thats the key piece of information, swinging that jaw piece. Probably would need an arbor or plate to hold it, but that is very do-able. Looking forward to seeing the thread! 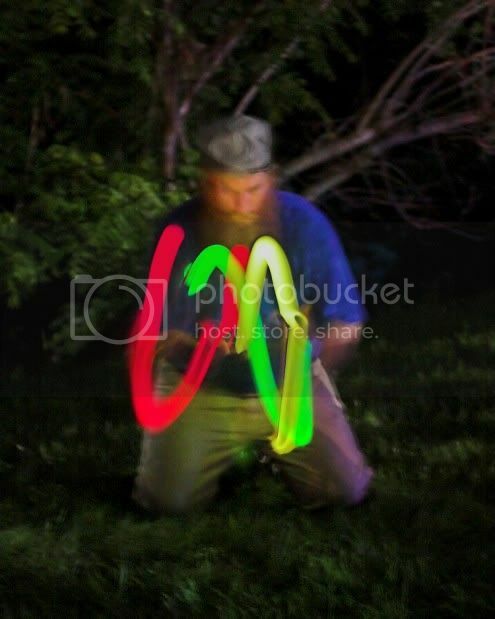 Definitely a cool project! The molds are beautiful! & great work on the drawings for these vises Dave! No worry. Just need something to make Zee think I won't build the Stanley after the Marion! Bad Behavior has blocked 12750 access attempts in the last 7 days.